Want to create a fun and inspiring atmosphere for a consultation exercise? Would like to consult a local community regarding plans for a local park or building development? Want to inform a local community of future plans? Need to generate ideas from young people? Art4space have run a series of consultation days generating ideas and getting feedback on what the local people need from a community project, open space or new development. Art4Space can liase closely with councils, housing associations or other groups to identify exact information required from the local community. We can create a tailor made package of consultation exercises and activities which will build a robust picture of what a local community wants from a given project. 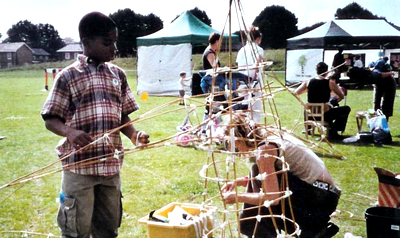 Art4Space have a number of consultation exercises and creative ways of drawing ideas from local communities that can attract all age groups. Trees for London commisioned Art4Space to undertake several consultation activities which proved to be a huge success. Art4Space creatively involved residents at the consultation and design stages of their new open space in the heart of Moorlands Estate, Brixton. To engage participants Art4Space use various creative approaches: play, sculpture, discussion, games, models, murals and banners. We have found that these approaches inspire thoughts, feelings and views on many aspects of community life. A fun, hands on way of getting people involved. 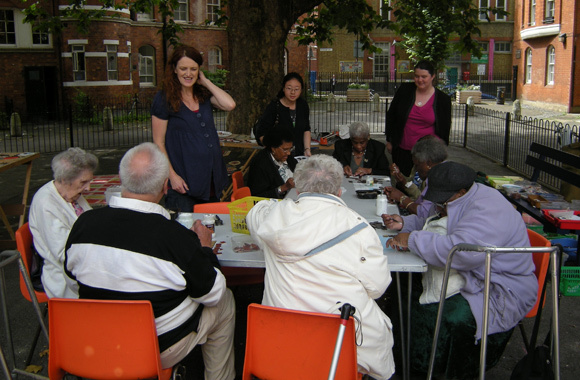 Can build confidence and encourage expression from groups who may otherwise find it hard to participate in consultation.